San Antonio plans to regulate scooters and dockless bikes to avoid problems experienced in Dallas, where an estimated 20,000 dockless bicycles rolled into the city and at times found themselves littering corners and obstructing sidewalks. In a January letter to companies Ofo, Lime, Vbikes, Mobike and Spin, Dallas City Manager T.C. Broadnax insisted they keep the bikes off certain sidewalks, off private property and keep them from blocking sidewalk ramps, otherwise they would be confiscated. Both Lime and Ofo have contacted San Antonio about bringing their dockless bikes and scooters here, according to city staff, and the company Bird launched 150 of its electric scooters two weeks ago. The popularity of the electric scooters has Bird valued at $1 billion by Sequoia capital in a recent funding round. The electric scooters can be rented through an app at an hourly rate. “This is obviously a very new innovative technology so we don’t really have anything in ordinances that directly address this,” said John Jacks, director of center city development. Because the city doesn’t have any regulations specifically for electric scooter companies, the city has relied on users to keep sidewalks unobstructed. 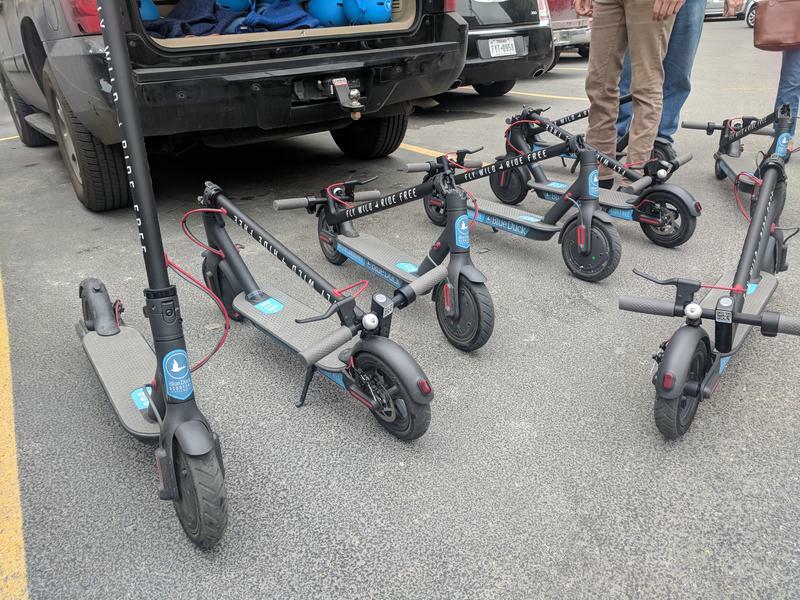 But when scooters are left in the way of pedestrians, the city has been collecting them, Jacks said. "We’re being very particular of which ones we are removing,” he said. “We're not removing them just because they are on the sidewalk — it's if they're actually blocking the pathway." CCDO is looking for a “measured approach,” said Jack, that could include a cap on total scooters or vendors. It might also require geofencing around sections of the city to keep the scooters off parts of the Riverwalk barred from bikes, as well as off Alamo plaza. Geofencing uses GPS technology to block the use of the app or signal users that they are in a restricted area. Bell said he doesn’t oppose the regulations, and plans to talk to the city about “commons sense” regulations. For instance, he agrees that geofencing should be used in certain areas. “We don’t want these piling up in front of the Alamo, and we don’t want these piling up on the Riverwalk,” he said. Bell said it is less likely that scooters would pile up anywhere for any amount of time the way the bicycles do. Because they are electric, they have to be recharged and collected regularly. “Logically, it makes sense to classify electric scooters different than bicycles,” Bell said. But, he added, he supports any pilot regulations that may cover both the same way. The department will hold a stakeholder meeting this month and plans to present draft regulations to the council’s transportation committee in early August.